A little sneak peek at the pillow I'm working on. I wanted something for Valentine's Day, and thought I would use traditional red. But just like Christmastime, I wasn't quite in the mood for really having red in my more neutral color scheme. 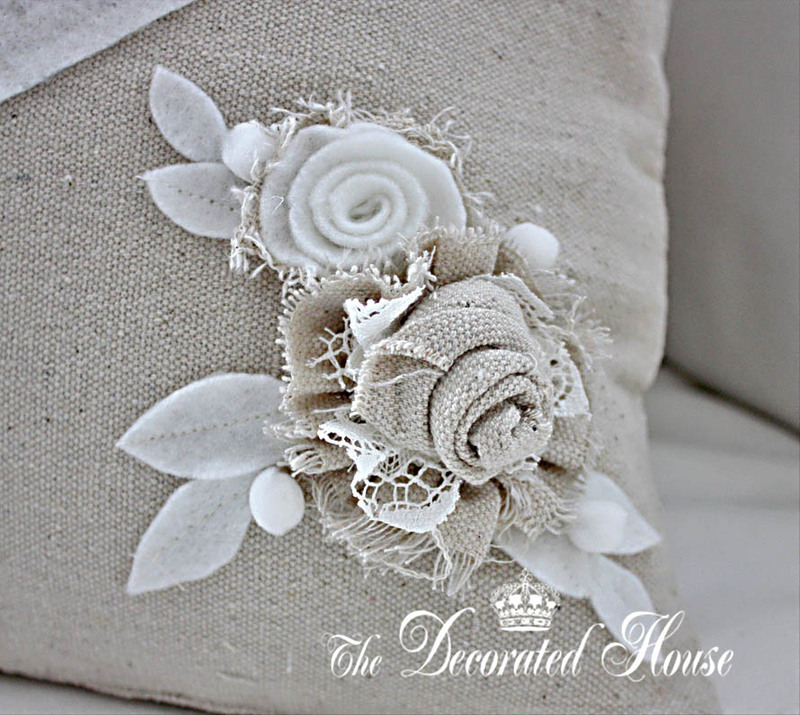 So instead, the flowers, the pillow and the rest of the decorations will be in the greige, taupe and white colors. These flowers are made from a thick unbleached cotton, with the edges frayed some, and old lace, with a white felt flower and leaves. The combination is subtle in color and textures. Just a little sneak peek while I get some photos taken and ready to post. As I'm thinking about a little decorating for Valentine's Day, I remembered a post about a beautiful set of dishes that now belong to my Sweet Daughter. So here is a little repeat of that one for you. Most of my “old” blog friends have heard the story of how I turned down this beautiful set of red transferware dishes that had belonged to my husband’s grandmother. Not once or twice, but a few more than that. It was quite a while ago. No one in their family wanted them so we were given a chance to have them. Sometime later the set was offered to Sweet Daughter, years before she had her own home, and she happily accepted them. A few years after that, I was sorry I had turned them down. They are so pretty, so vintage, and so charming. I kept them for safekeeping for a several years and used them just like I owned them. By now I had come to appreciate them much better. So I thought maybe Sweet Daughter would forget about them or decide she didn't want some "old lady" dishes from so long ago. But when she bought her first home, she was quick to take some of the dishes to their new home. I still got to keep some. 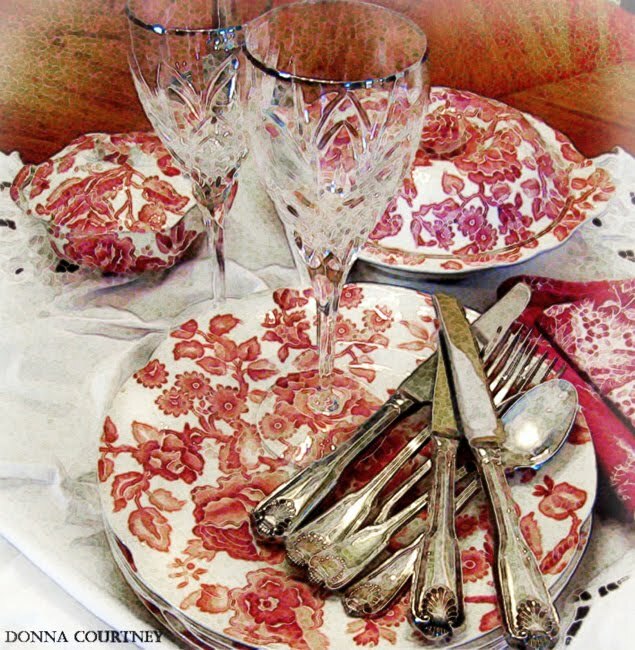 When she recently had a party, she needed a lot of dishes and the red transferware was called into duty. Usually I bring out these lovely old dishes because the red is so perfect on Valentine's Day. This year I'll miss them except for the very few pieces I still have. Lesson learned. This day is always more like the true beginning of the new year for me. It's the last day of celebrating the Christmas season, and we have a tradition of having one last special meal together, although it is a peasant meal for sure. What better time than Winter to look within and seek Wisdom? It's a natural instinct to slow down. Although we don't hibernate, it sure seems like everything around us, and within us, tells us to live more slowly and quietly. Some people are almost afraid of silence, but I love it. Not as much as the sound of the ocean or the song of a loved one's voice, but the stillness is beautiful. Of course long term as some monks and nuns have lived would be a bit too much for me. The story of the, Magi, men of Magic and Astrology who were priests and followers of Zoroaster, has always intrigued me. They had to travel over 1,000 miles from Persia (Iraq, today) to come see this new person predicted by their stars. 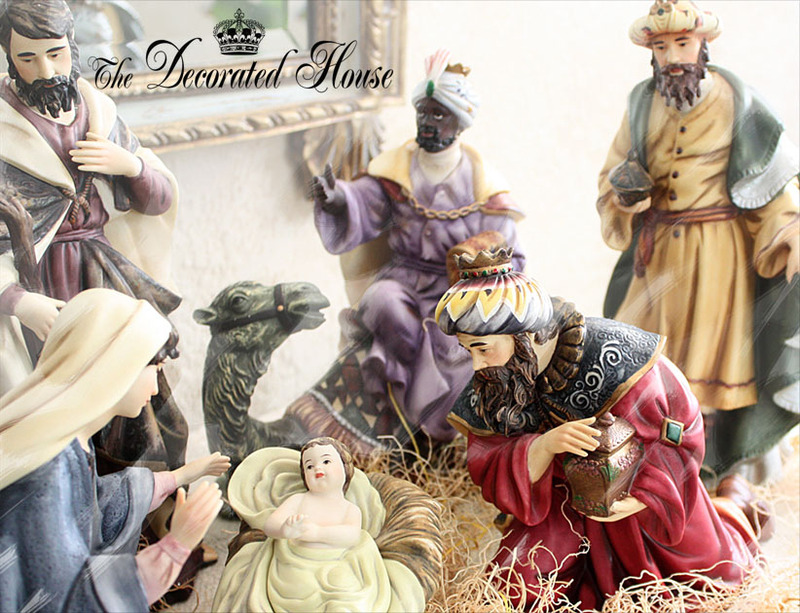 There is no known number of the priestly visitors, although we often think of only 3 because of the three gifts that are mentioned in the story. It is the the symbolism of the visitors and the gifts that I like to celebrate each year , which are the reminder to seek Wisdom, and to treasure Gifts of the Heart and Spirit. We look forward to this special day because it means it is time of French Onion Soup! Since we don't eat red meats, I make it with chicken broth instead. I'm sure it's lighter tasting but after all these years it taste perfect to us. It is a simple peasant meal of soup, French Bread and fruit salad. There's always something chocolate, too. This year homemade gluten free Chocolate Chip Cookie dough is the fridge waiting to be baked up fresh!